In recent weeks, French President Emmanuel Macron has spoken out forcefully in favor of the European Union and Venezuela’s opposition protests. He has dominated town hall meetings to address grievances at home, and sought stronger ties in China. 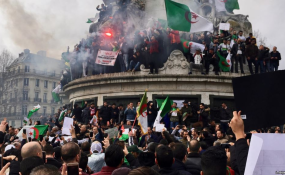 But when it comes to addressing the political crisis roiling former French colony Algeria, just across the Mediterranean, the normally loquacious Macron and his government have been remarkably silent. After ailing Algerian President Abdelaziz Bouteflika, 82, announced a controversial re-election bid on Sunday, the Elysee presidential palace issued only a brief statement, blandly expressing support for a vote “under good conditions,” and Algerians’ right to freely choose their government. But today, some are calling on Paris to do just that and side with the Algerian street. “The French government will be very prudent” as it wonders whether Algeria’s ruling party, in power since independence, will topple or be “reborn from its ashes,” said Sciences-Po University North Africa expert Khadija Mohsen-Finan. Other observers warn such a step could undermine France’s delicate but strategic relationship with the Bouteflika regime, and that key French priorities —from curbing migration and terrorism in the Sahel, to Algerian gas exports to France — risk being compromised if the North African country tips into turmoil. France’s rocky history with Algeria partly helps to explain its hands-off stance today. Successive French leaders have refused to formally apologize for decades of occupation, which ended only in 1962, after Algeria’s bloody and protracted revolution. That includes Macron, despite controversially calling French colonialism a “crime against humanity” as a presidential candidate. Paris also kept a low profile during Algeria’s brutal civil war in the 1990s, which pitted the country’s military-backed government against an Islamist opposition. That did not stop Paris from being targeted by Algeria’s Armed Islamic Group (GIA), who blamed Paris for siding with Algiers. In the early 1990s, the militants killed French expatriates, hijacked an Air France plane, and launched several terrorist attacks in Paris. Under Macron, France has tried to forge closer economic and security ties with its former colony. Visiting Algiers in late 2017, the president called for opening a "new chapter" with Algeria, and urged young Algerians to look to the future. “There are so many ties that unite us — history, shared memory, the Algerian community here. It’s completely normal that they should be attentive of what happens in Algeria,” Algeria’s ambassador to France Abdelkader Mesdoua told C-TV of Macron’s government. However, the ambassador also pointed to French statements about respecting Algerian sovereignty. While the past looms large in bilateral ties, Algeria today is considered a key ally in battling Islamist groups in the Sahel, where France deploys more than 4,000 troops. Some French also consider it a bulwark against mass migration to Europe. “The aspirations of Algeria’s youth are completely legitimate,” said Jordan Bardela, senior member of the far-right National Rally Party in remarks on French TV, even as he warned that instability in Algeria could unleash “immigration without precedent” from sub-Saharan Africa and by Algerian youth — an assessment experts say is overblown. Yet among Algeria’s sizable diaspora here, some are calling for a stronger French response. Another demonstrator, Yasmine Bouaouiche, blamed French authorities for propping up what she considers a repressive regime for decades. “The French government needs to cut the cord,” she said. Some media have also waded into the debate. An editorial by Europe 1 radio criticized Macron’s noncommittal stance as motivated by a misplaced fear of Islamists coming to power in Algeria, and posing a potential security threat to Europe. But other analysts believe French authorities are truly caught in a bind.